Honey Cake is a soft and moist cake made with honey and can be had as a snack cake with tea. 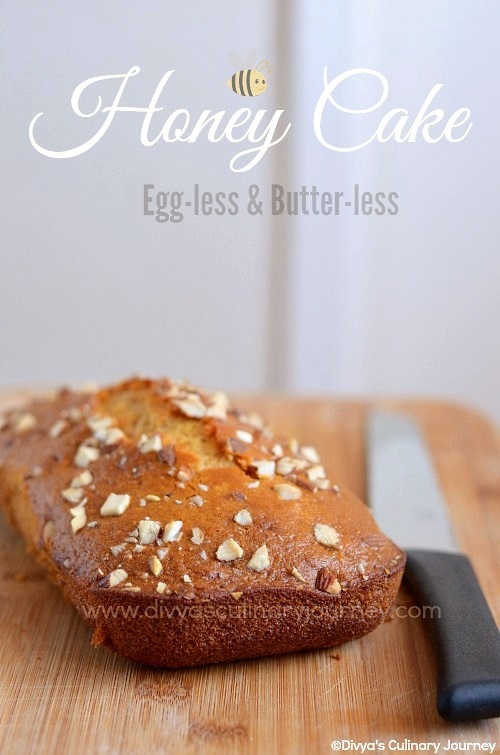 This version of honey cake that I am posting today is egg-less and butter less. I have already posted Honey Cardamom Cake (it has both egg and butter), it is a hit among my friends and almost everyone has tried this cake and has given very good remarks. One of my friend loved the cake but she wanted egg-less version to try at home. So for her searched and got the recipe and tried it. The cake came out so soft and moist and tasted delicious. 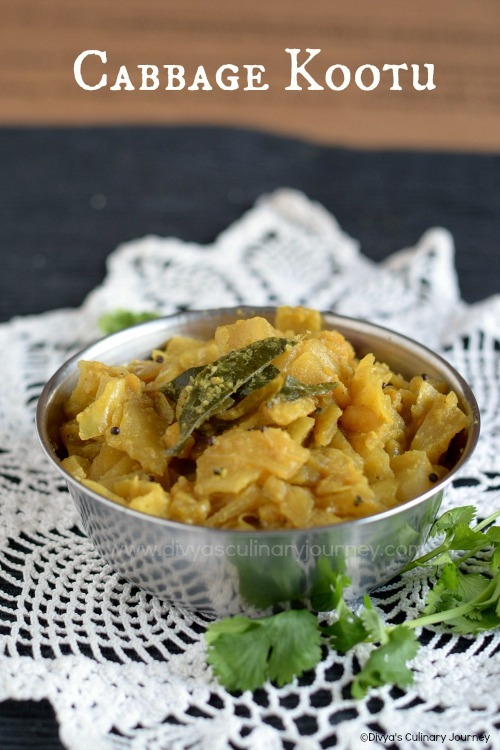 Cabbage kootu is a very healthy and comforting vegetable side dish. This Muttaikose kootu is made using kadalai paruppu (Channa dal). Recently one of my friend made this kosu kootu for a potluck lunch and I instantly fell in love with it and I wanted to try this at home and got the recipe from her and made few changes to suit our taste. 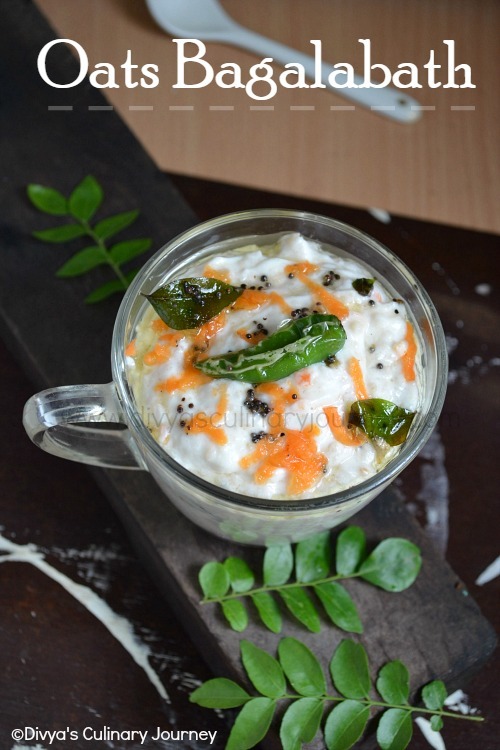 I have prepared this few times now and everyone at home loves this comforting kootu. I serve this with rasam rice and if there are any leftovers I would serve this with chappathi too. Kulcha Recipe | Easy recipe for home made Kulcha | How to make soft Kulcha ? 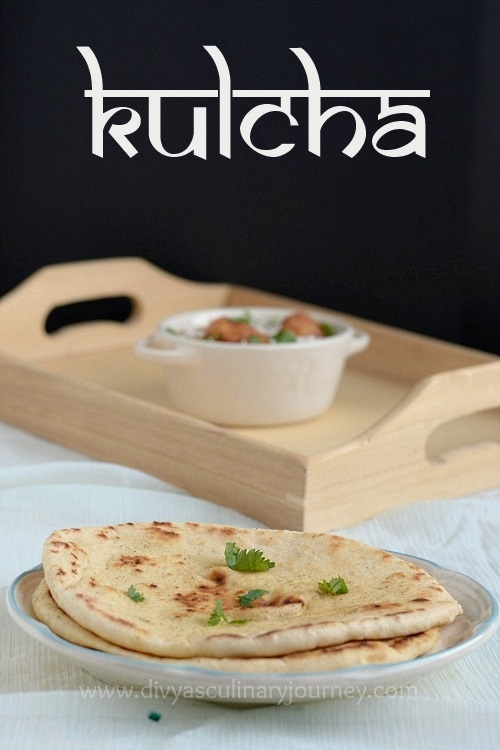 Kulcha is a soft leavened North Indian flat bread originated from Punjab. Soft kulcha is popular item in restaurants menu. It is usually baked in Tandoor oven and is served with Chole (spicy chickpea curry). But it is easy to prepare soft kulcha at home too. Here I have posted the easy stove top method for making kulcha. While taking about kulcha, there is always a question regarding what is the difference between Naan and Kulcha? Naan is leavened using yeast while kulcha is leavened using baking powder, baking soda and yogurt. Kulcha can be either plain or stuffed. This is a recipe for plain kulcha. I tried this Kulcha recently and was a great hit at home. Every one loved this soft kulchas especially the kids. I have already made this Kulcha second time this week. If you are looking for perfectly soft kulcha, that can be easily prepared at home, then your search ends here. Malai kofta gravy is spicy dumpling of paneer and potato deep fried and simmered in creamy tomato based gravy. Malai kofta is very famous in any restaurant menu. 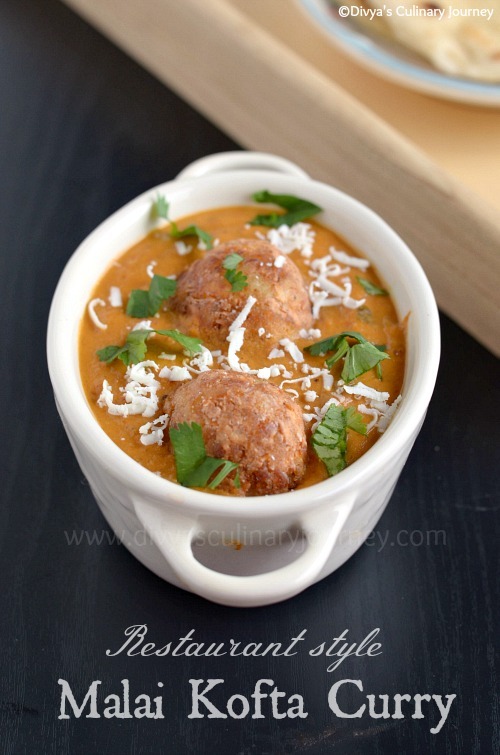 This restaurant style malai kofta gravy is rich and high in calorie. This gravy can be served with Roti, naan or rice. Though I prepared this gravy almost a week ago, I couldn't post it on time. Better late than never right, so am posting this recipe now. I have heard from some of my friends that the dumplings while frying will may disintegrate and I was so worried about that. But following this recipe, the dumplings (kofta ) came out perfect and the gravy tasted delicious . Microwave Brownie in a Cup Recipe (Egg-less) | One Minute Microwave Brownie in a Mug | How to make brownie in microwave? This is the best and easy microwave mug brownie I have ever tasted. This easy microwave brownie is made without egg in a mug. It takes just few seconds to put the ingredients together and a minute in the microwave.. Voila!! the brownie is ready. If you are a fan of fudge type brownies, then you will definitely love this microwave brownie. This is sure to satisfy your cravings instantly. If you are like me, who doesn't like to share their sweets, then this can be called as single serving. 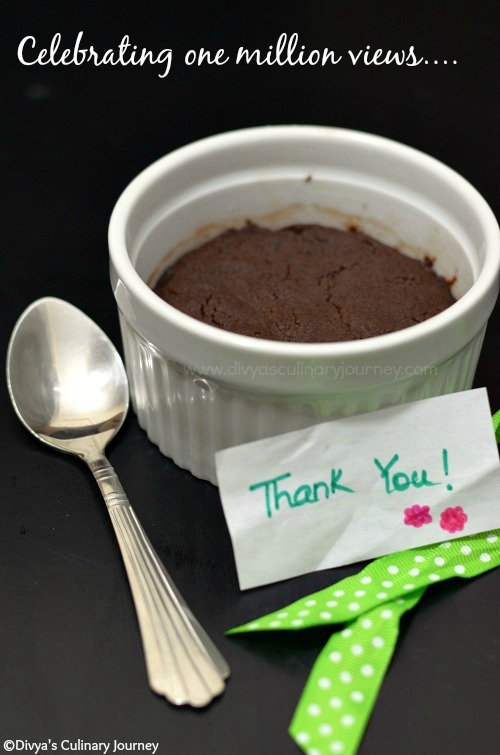 I am so happy to share with you all that Divya's Culinary Journey has crossed over One million views and I am sharing this easy egg-less microwave brownie recipe to celebrate it. I would like to thank all of you for your continued support. Cranberry Rice is a simple and delicious rice made with fresh cranberries. This rice is made in South Indian style and is Vegan. This rice has the tart flavor and lovely color from the cranberries. 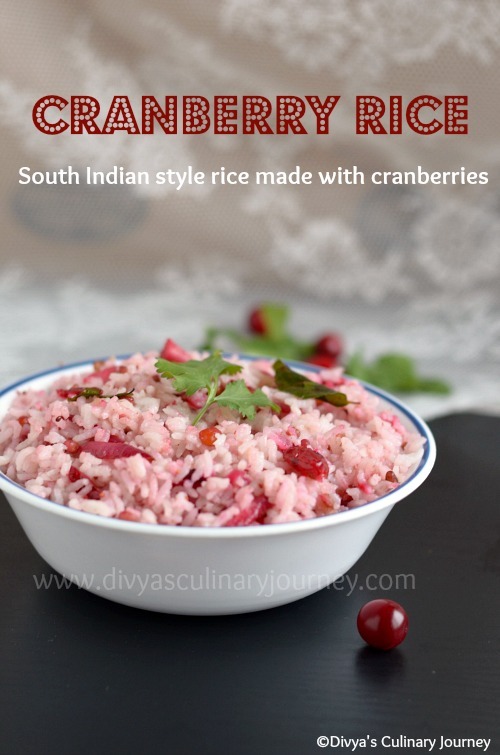 It takes just minutes to prepare this cranberry rice and is easy too. This rice can be served with appalam, fryums or even chips. While googling about cranberries, I came to know, in tamil it is known as' Kuruthinelli'. It tastes almost like nelli (gooseberry) and is red in color like blood. I have seen these cranberries after coming to US only and my son loves dried cranberries a lot and he has it with snacks and with cereals and I was under the misconception that the cranberries are sweet until I got some fresh cranberries and tried them. They are tart. Using fresh cranberries I have baked Cranberry Coffee Cake and now tried this Cranberry rice.